So I am sure you all remember Jennifer Wilbanks, the runaway bride who turrned up in New Mexico after claming she was taken hostage right before her wedding. 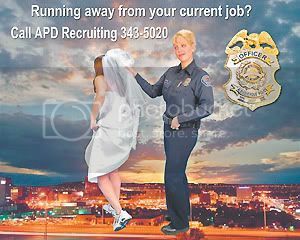 Well now its seems that the Albuquerque Police Department is using the runaway bride legacy in their new recruiting ad that will be displayed on digital billboards in the city for the next month or so. The image which shows Trish Hoffman, APD Spokeswoman, tugging on a woman in a wedding gown was on the front page today of the Albuquerque Journal. This cracks me up. I laughed so hard this morning when I saw the picture that had I been drinking anything, it would have come out my nose. Also, must have been a slow news day for it to make the front page and as large as it did too. That is hilarious. I read that today. Guess there were no babies were born in street for headlines. What a funny thing for Albuquerque to be known for! I remember I was working the day they escorted the runaway bride through the airport to send her home. I saw her with a towel all over her face. Too bad really. I wanted to see if her eyes were as bugged out in person as they looked in that picture of her that was all over the news.